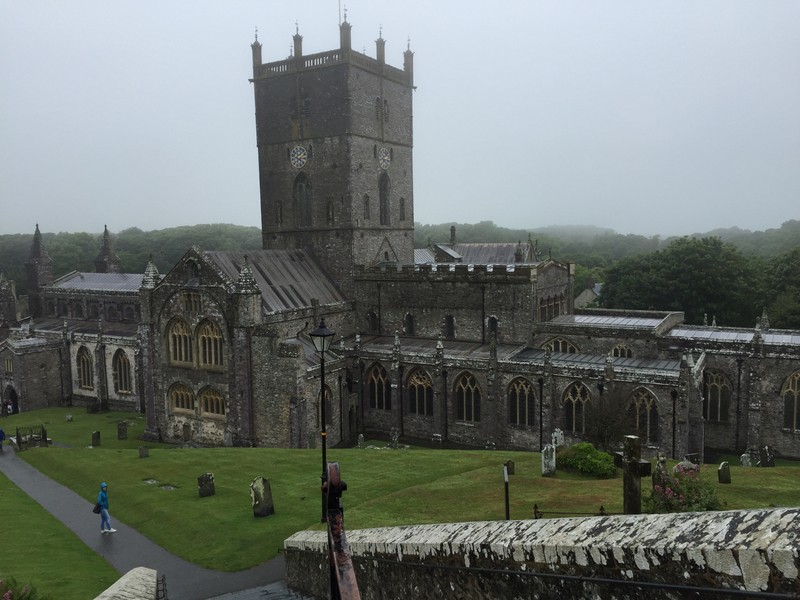 A misty St David’s Cathedral, our final destination. Most of the group were staying a mile or so along the coast in or near a small, family-run hotel (The Ocean Haze). Lizzy had planned it so that we could approach St David’s from the coastal path. As you can see from the photographs, Sunday was a very different day from the sun-baked Friday and Saturday. 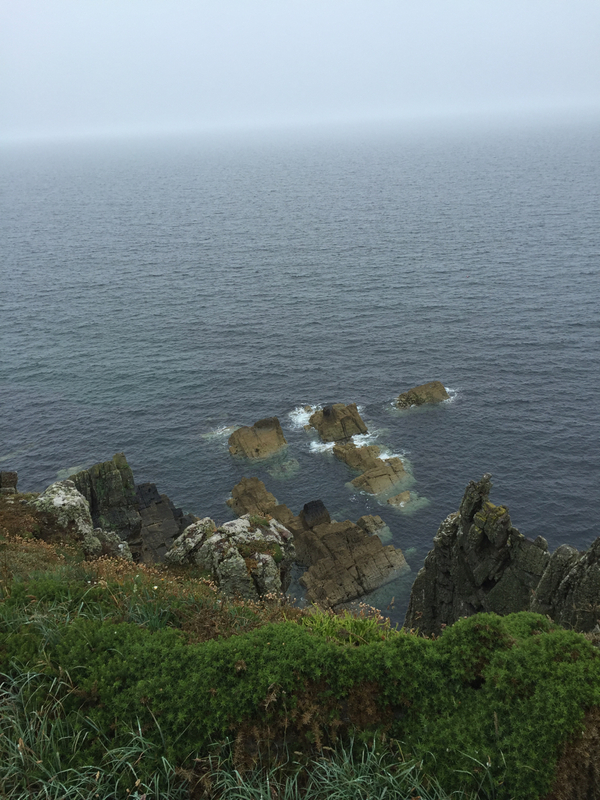 A mist pervaded the coast (and, sadly, the photography), though the weather was mild. 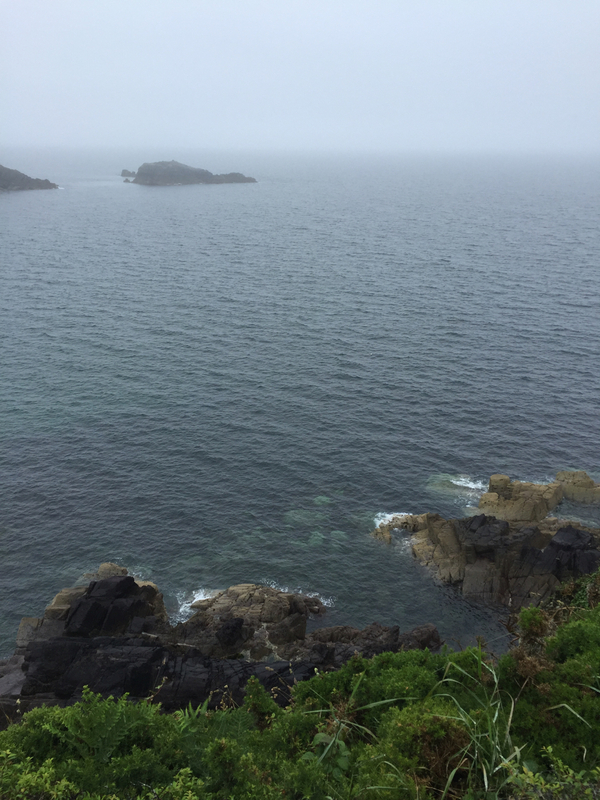 The coastal path here offers intense beauty, no matter what the weather, though I have been accused of being a bit of a masochist when it comes to walking in the rain…in my view, it’s all part of the fun as long as you’re dressed correctly! 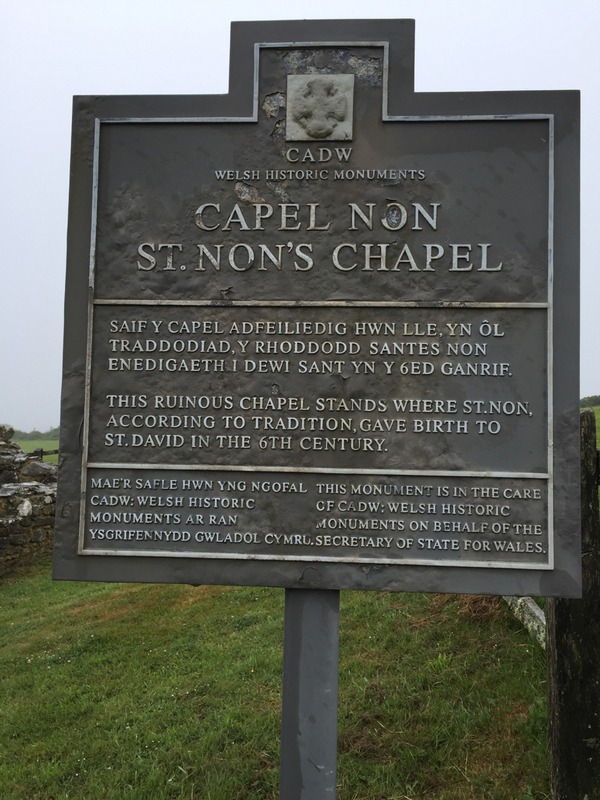 After what seemed like a short walk, we emerged from the footpath and directly into our first stop – St Non’s Well and the ancient and modern versions of St Non’s Chapel. 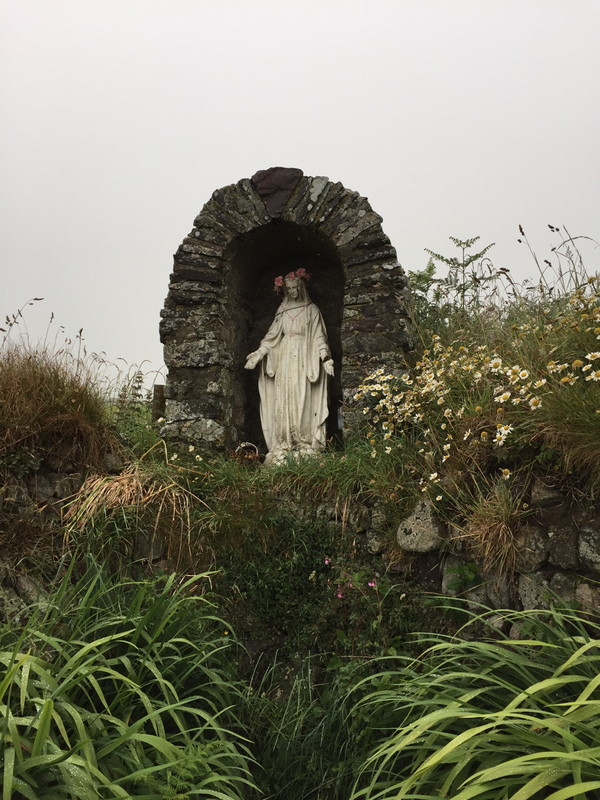 The single site, of about an acre, is home to the Well, the old (ruined) chapel, and the more modern chapel, which is old enough to have its own, interesting history. There is also a retreat centre above the newer of the two chapels. 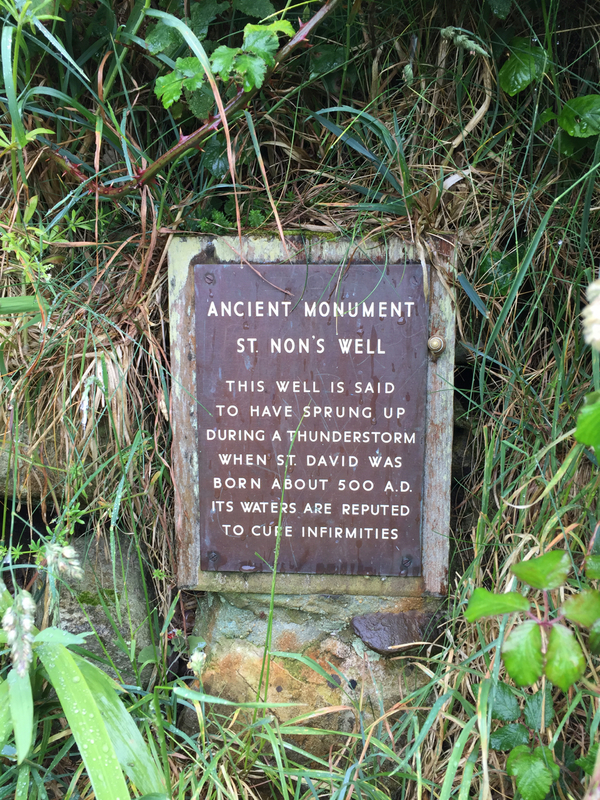 The sign tells us that St Non’s Well is said to have sprung up during a thunderstorm when St David was born, about 500 A.D. The waters are said to cure infirmities. There are two versions of St David’s origin. 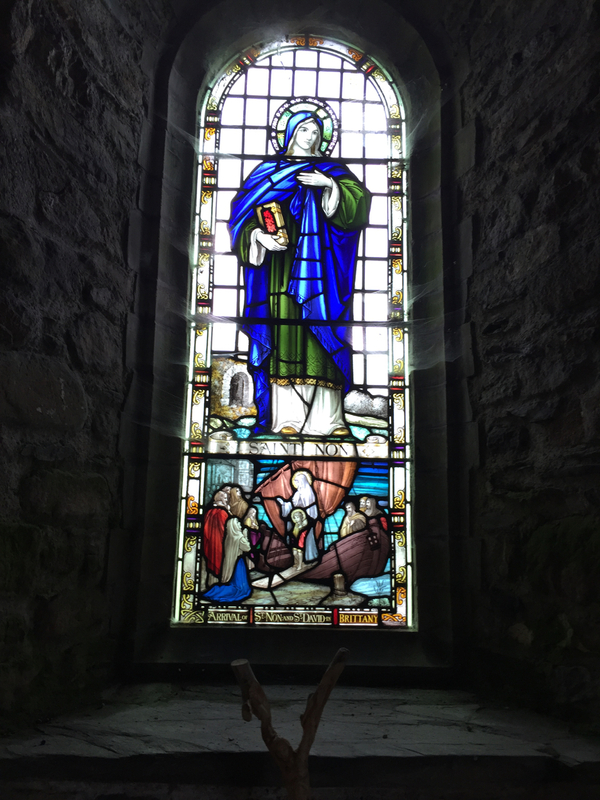 The first is that he was sired by a local nobleman; the second that St Non, then a nun, was raped and made pregnant, but chose to keep the child and bring him up within the church… The gritty truth is often ‘sanitised’ in church history. 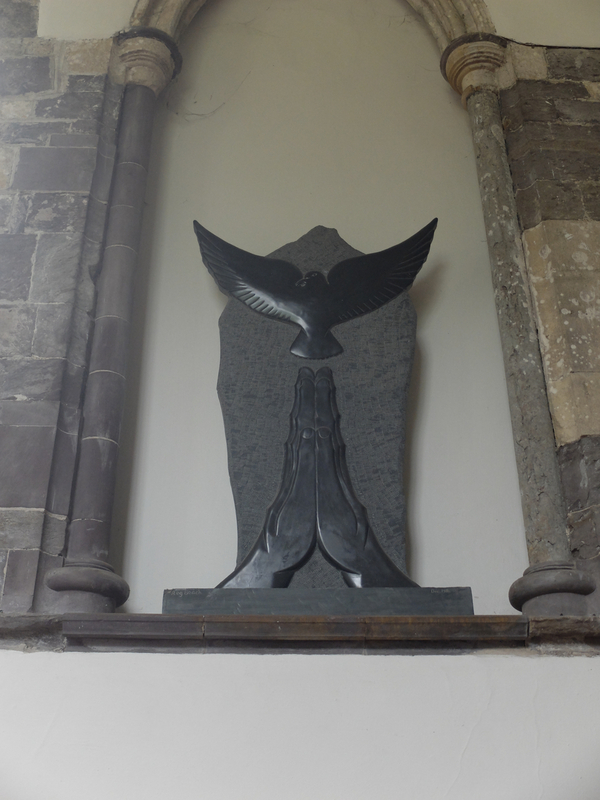 Either way, St David became a very influential figure in the life of West Wales, and far beyond. 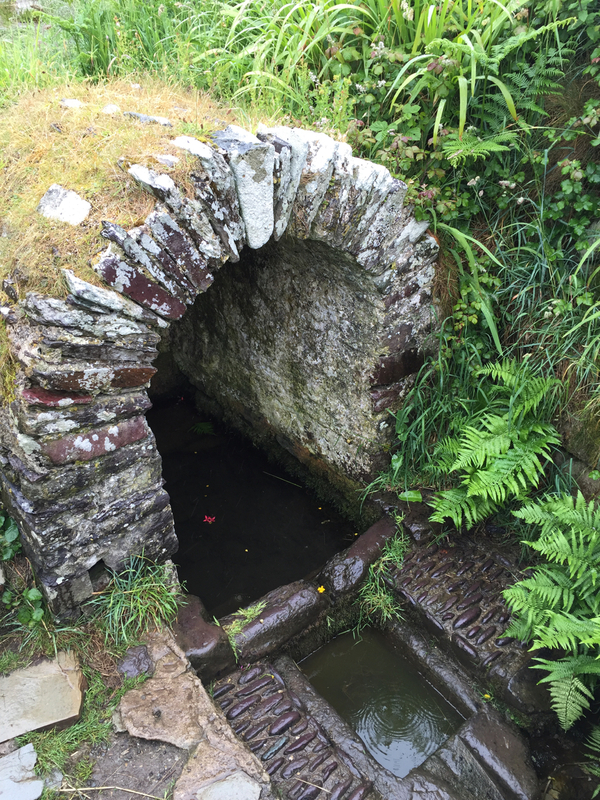 St Non’s Well is regarded as one of the most sacred wells in Wales. 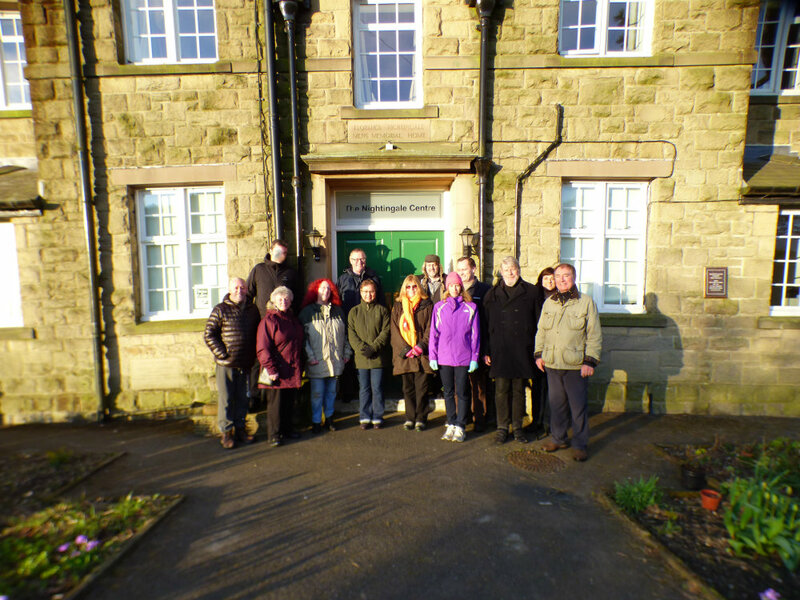 It was fully restored and re-dedicated by the Passionist Fathers in 1951. 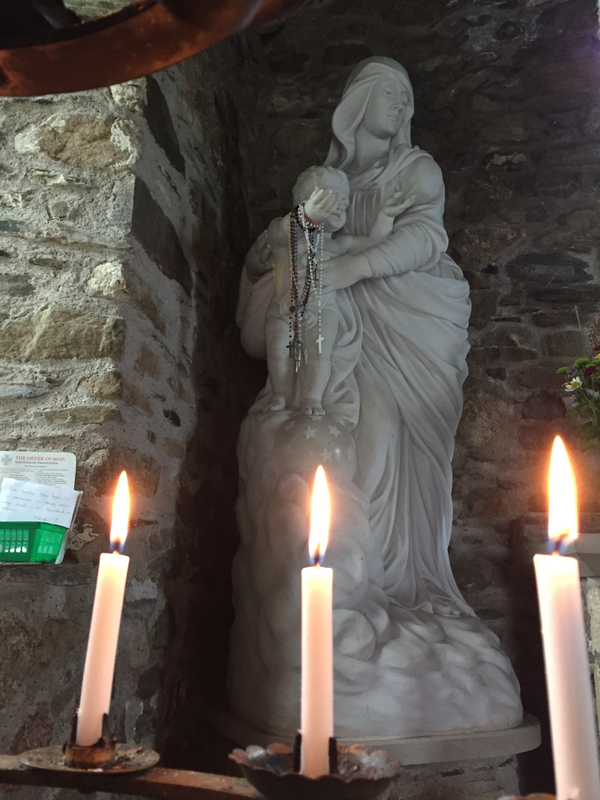 At the same time a small shrine dedicated to the Virgin Mary was placed opposite the well. A short distance from the well is the ruin of St Non’s original chapel. There is very little to see apart from the partly-demolished walls – with one exception. 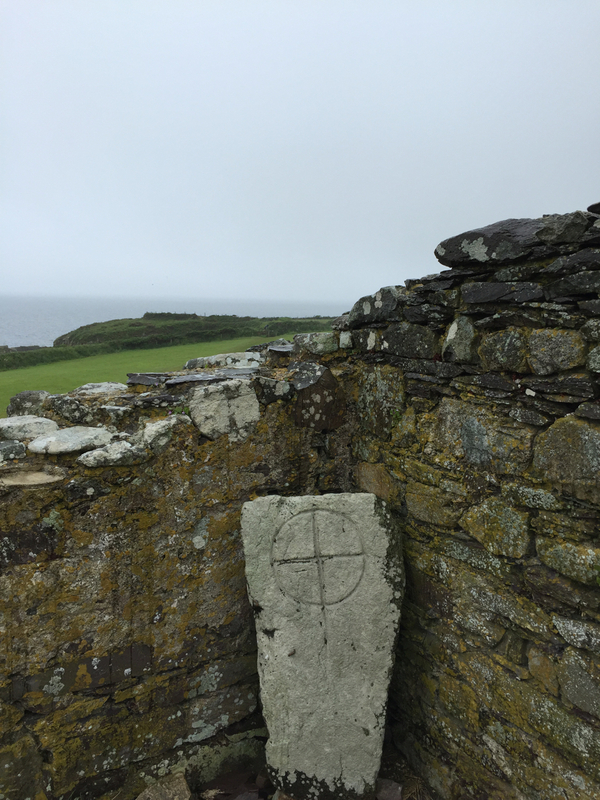 In the ruins of the Chapel built over the place of St Non’s house can be seen a 7-9th century creed stone with an incised Latin ring Cross. 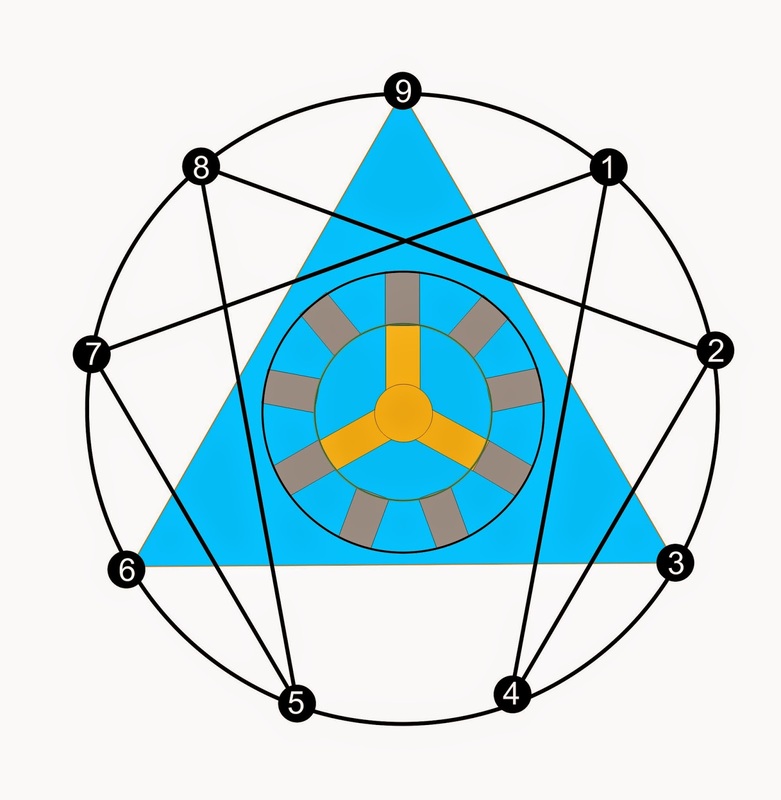 with a vertical line that descends from the Celtic circle in a very unusual way. This has come to be known as the Cross of St Non. Knowing it to be original I looked at it for a long time after photographing – it had a powerfully, peaceful effect, standing alone in the misty morning of that Sunday. 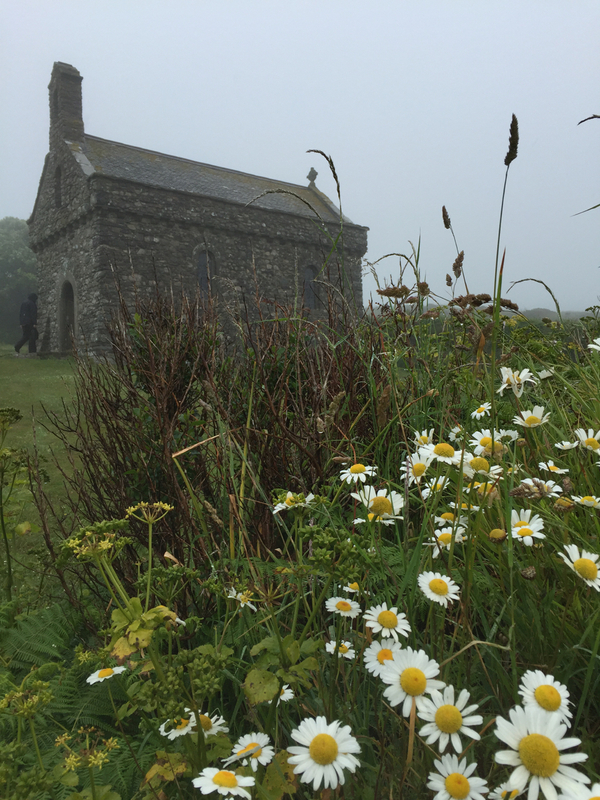 Just up the pathway from St Non’s Well is the ‘new’ Chapel of St Non, known as the Chapel of Our Lady and St Non. 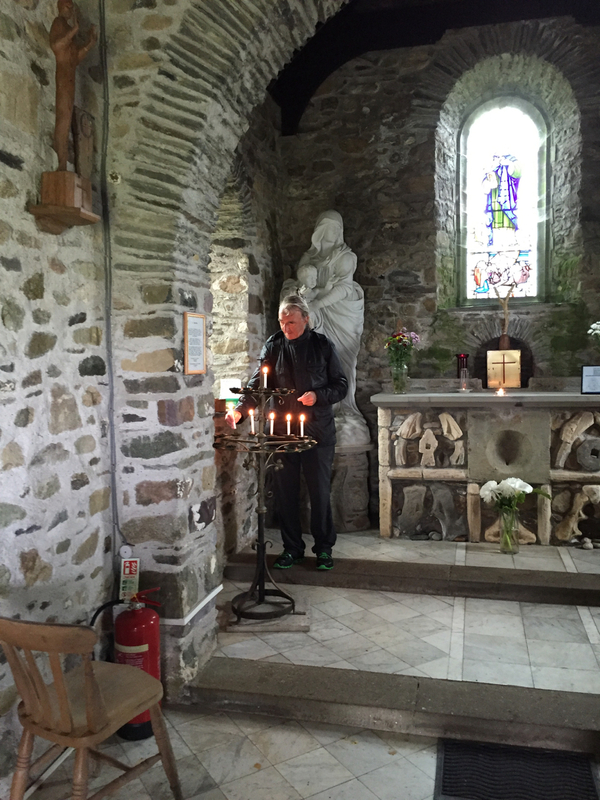 The chapel is a very simple structure and measures 25 feet long by 12 feet wide. 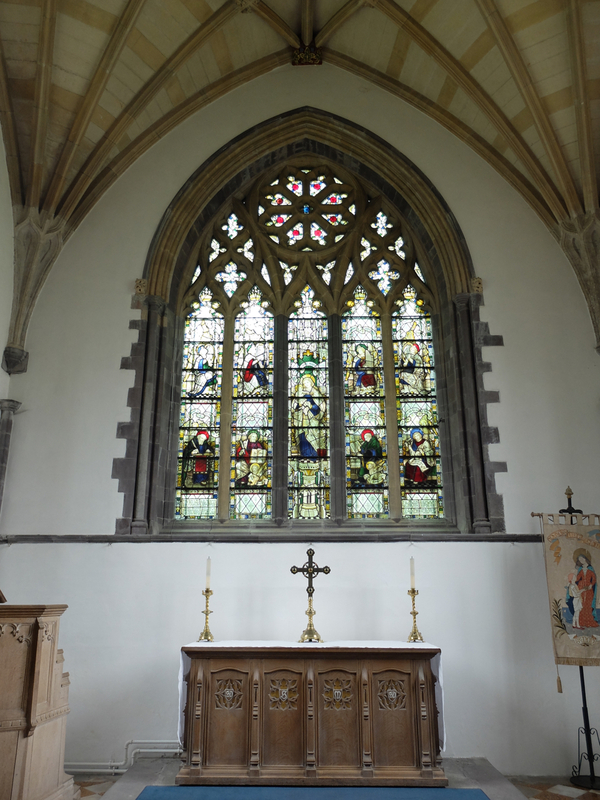 It has beautiful stained glass windows of St Non, St David, St Bride, St Brynach and St Winifred. Cecil Morgan-Griffiths died the year after the new chapel was completed. It is a truly beautiful place and we all drank in the humble simplicity, which was to contrast, later, in my mind at least, with the sheer size and magnificence of St David’s Cathedral. The window to St Non. 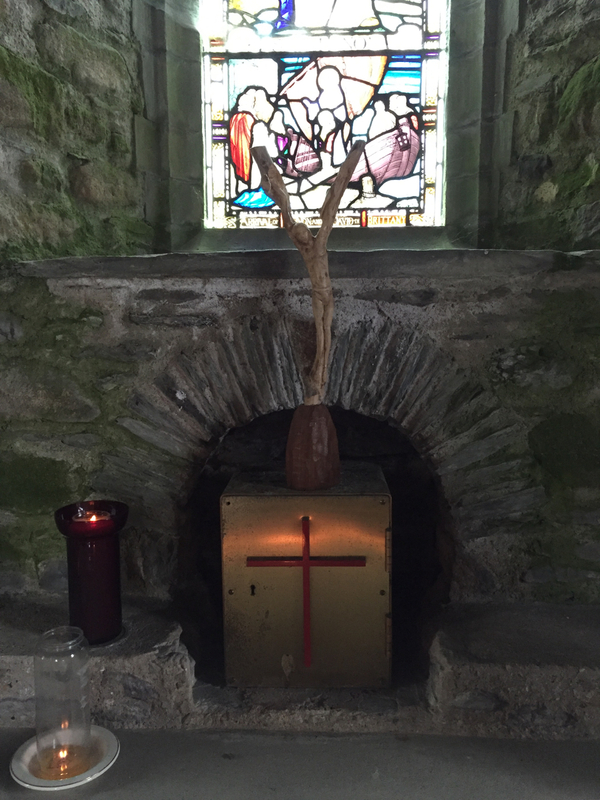 We made time for a group prayer, for one of our Companions fighting a terminal illness, then left quietly, bound for the final destination, the Cathedral of St David’s. 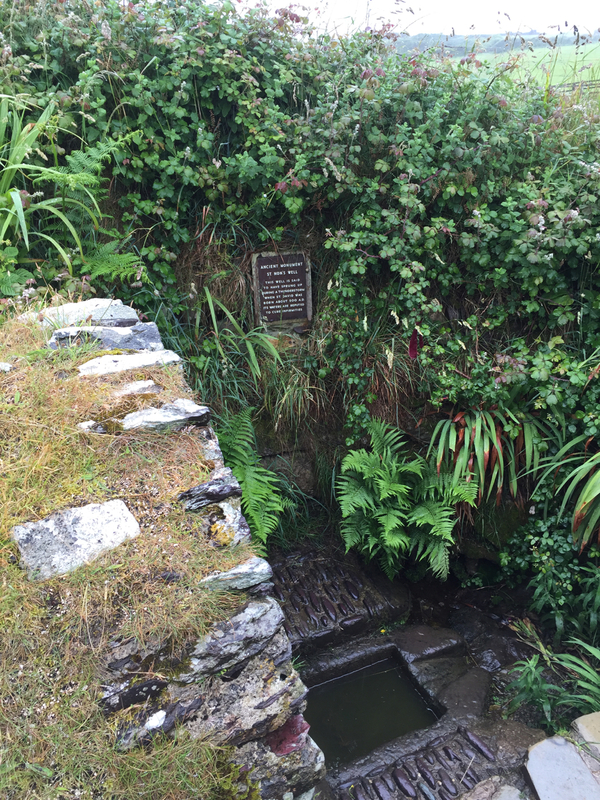 Coming from the coastal path, and St Non’s Well, we entered the Cathedral precinct by the ‘back door’, so to speak. St David’s has to be one of the most beautiful Cathedrals in Britain, if not the world. It’s location may seem remote to modern minds, but in mediaeval times St David’s occupied a strategic position at the junction of major land and sea routes between England, Wales and Ireland. 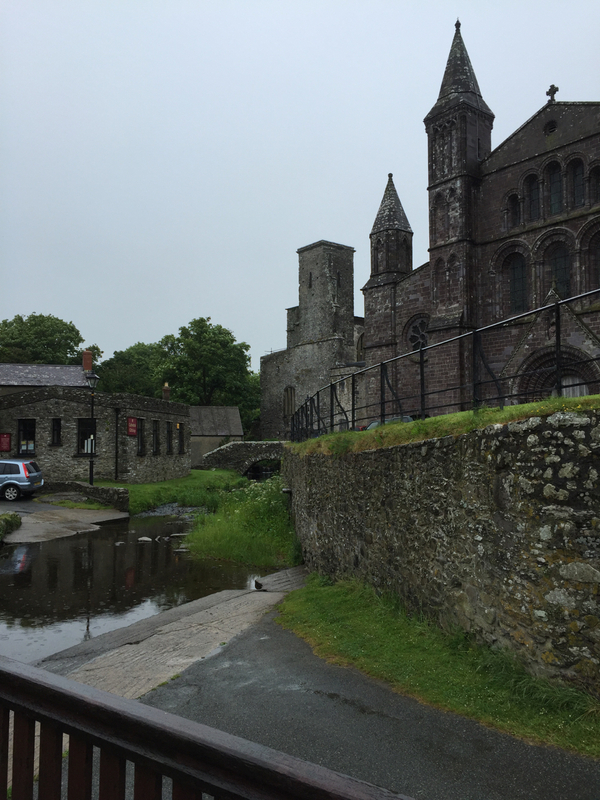 Originally a monastery, St David’s dates back to around 600 A.D. In its fifteen hundred year life, it has seen tumultuous change. During the first four hundred years of its life, it was attacked and destroyed many times by tribal raids. Two early bishops were murdered in later Viking raids. 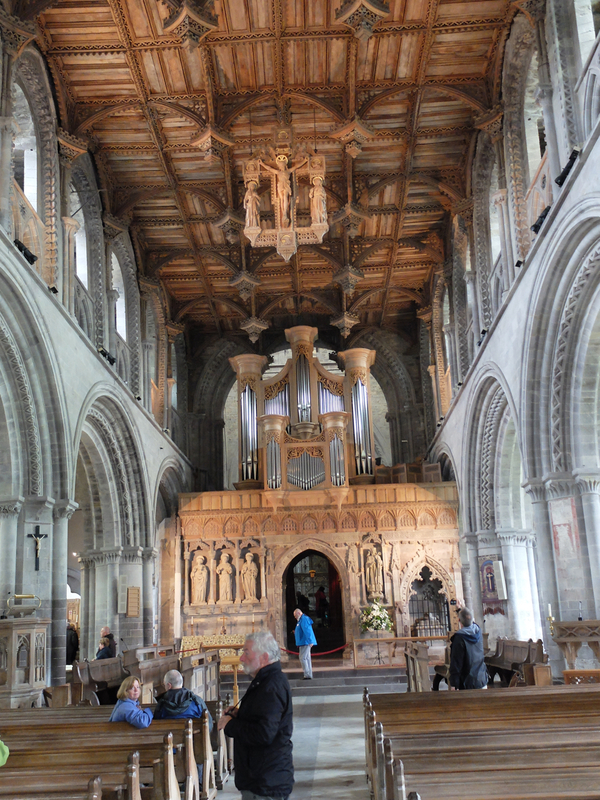 In the 9th century King Alfred turned to St David’s for help in rebuilding the intellectual life of Wessex. 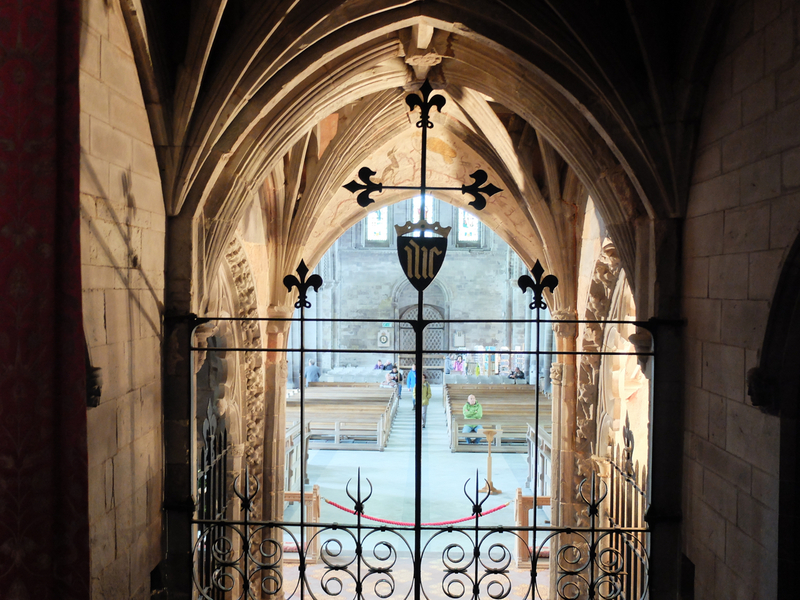 The Cathedral was visited by William the Conqueror in 1081, when he came there to pray. 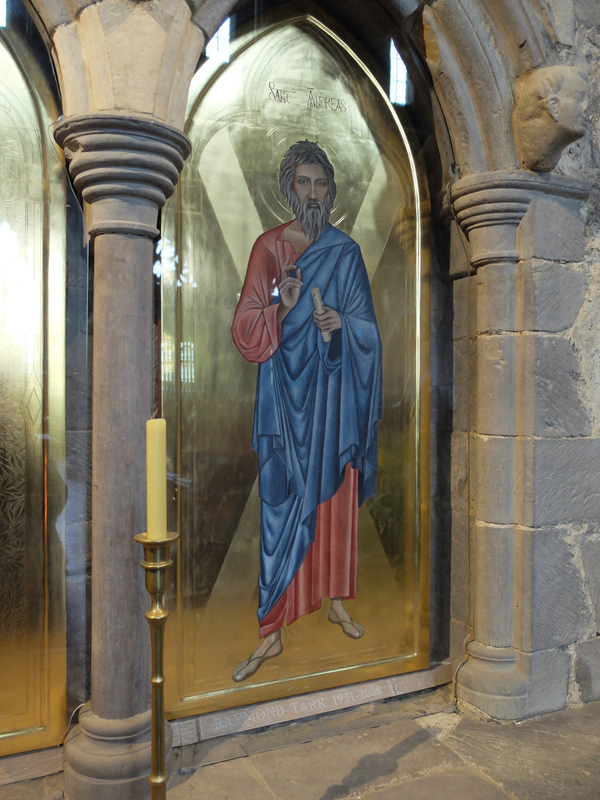 Then in the twelfth century Bishop Bernard, appointed by King Henry I, secured a “privilege” from Pope Calixtus II, allowing St Davids to become a centre for pilgrimage – an honour it continues to enjoy, today. During the English civil war, much of the building was destroyed by Parliamentary soldiers. The present structure began to emerge in 1181, when Cathedral status was secured. The list of prominent saints and bishops associated with that long history would require a volume or two, in itself. Better, perhaps, to take a few glimpses of the splendour of its wonderful spaces. There are so many separate interior spaces that it would take days for the visitor to feel comfortable that she or he had a meaningful mental ‘map’ of the place. The main ceiling are so beautiful that you just want to bend your neck and stare – which becomes a strain after a minute or two… Ideally, we could lie down on a blanket and just drink it in! 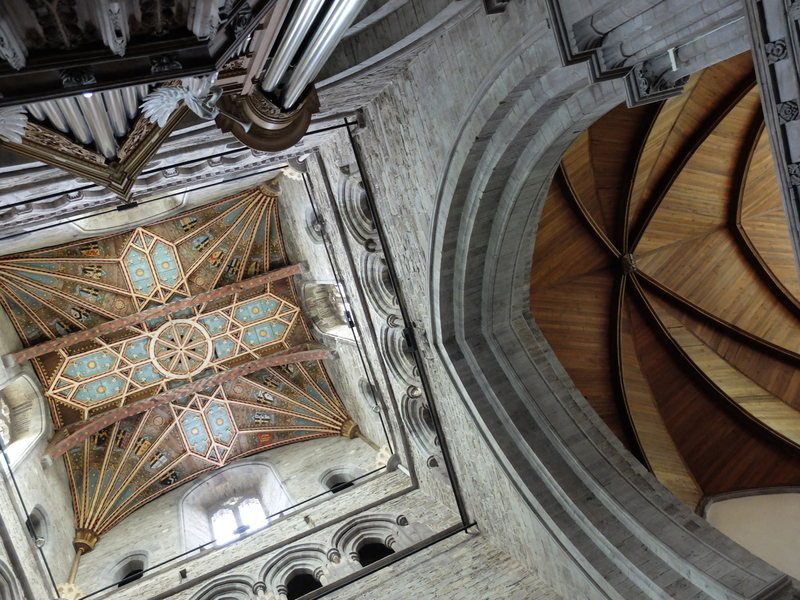 The magnificent vaulted ceiling of the tower. All too soon, we had to go, but not before a light lunch to prepare us for our long journeys home. This part of Pembrokeshire is very beautiful and warrants a return visit or six! 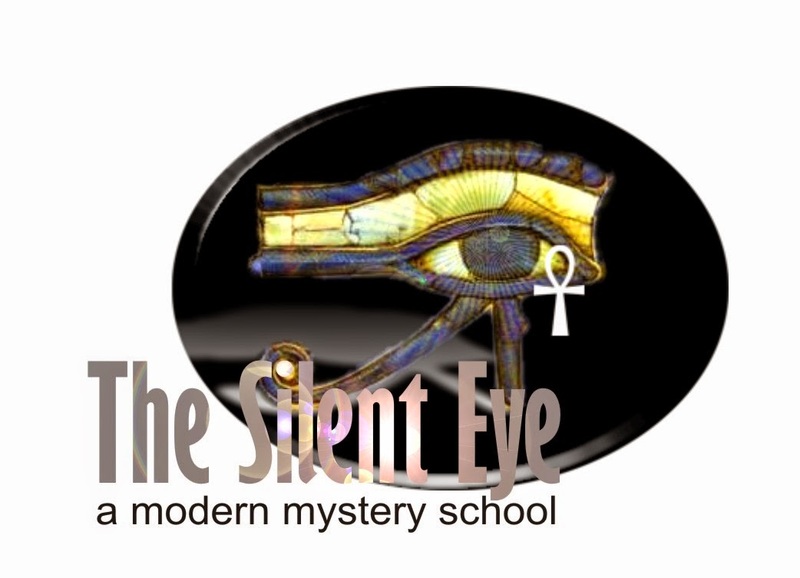 I really love holy Wells, and the stories of their creation. We have a lot of them over here, many of them still visited, but equally as many abandoned or forgotten or even destroyed. The little chapel is beautiful. And although the huge cathedral is grand and breathtaking, and I stared at those pictures with awe, I’d choose the humble little chapel. Its built for worship, not dressed to impress. I like that.